As I mentioned in my last post, talking about my goals as a blogger, one of them was to start sharing the monthly traffic report for Technolism. So, here we go. The number of visits has increased considerably over the past month (6k+ for November 2010) but the Bounce Rate is still quite high, which I am working on now and it also involved the upgrade to the Thesis framework soon enough. The average time spent on the site per user is still quite low (less than a minute). 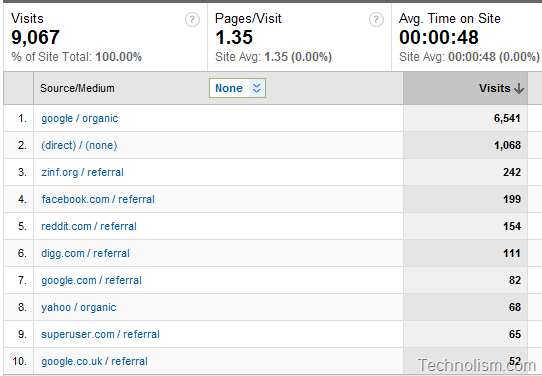 The number of pages per visit has been fine though at 1.35 pages per visit. We also managed to get some amounts of Traffic from social networking sites Facebook, Reddit and Digg but Twitter is missing in the list for this month. I am not using twitter very efficiently for now which I need to work on. How have your Traffic Stats been for the month of December 2010? Also, suggestions are welcome for me to improve traffic for Technolism. Nice Stats mate, I too have a very high bounce rate. And its because I have a high number of external links. May be its the same case with you. Bounce Rate is horrible, try to reduce it. Can you leave some advice? Use keyword rich description; which I guess you have also done.. So, keep posting and you will get results. It is not easy in the blogging battle now mate. But your early success is a good and needed motivation for further plan. Keep your hard work and you will reach your desired milestones for sure. Have you got any penny with your blog friend? Good amount of traffic. 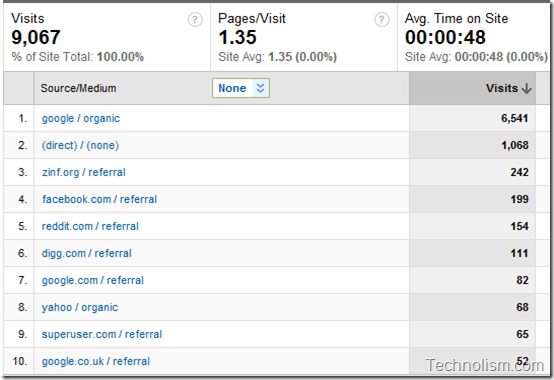 Even, I am receiving the same amount of traffic after 4 months of starting the blog. Hope you get more traffic and keep posting the traffic report here.